Brett Wolfe, Microsoft is to unveil eXpd8’s latest legal case management software. eXpd8, the Irish market leader in case management software, today announced its official launch of Thread in North America. Thread is a brand-new cloud-based legal case management software, built in collaboration with Microsoft which enables legal practices to free up valuable time, be more productive, increase profitability and truly digitally transform their firms. The pure cloud software, will be unveiled at an official launch in Microsoft’s campus in Charlotte, North Carolina on September 18 at 12 noon. Guest speakers include Dr. John Young, Honorary Consul for Ireland in North Carolina and Declan Branagan, Chairman and Founder, eXpd8. Built on the Microsoft Azure platform, Thread incorporates several Microsoft technologies including Microsoft Office 365, One Drive for Business and SharePoint. This enables Thread to provide law firms with the ability to manage their entire practice smoothly and efficiently whilst also ensuring government level security, compliance and seamless connectivity. Thread binds all the threads of a legal practice together. 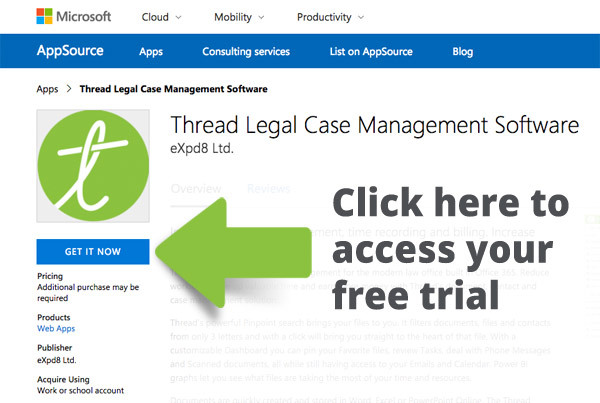 “Thread is truly the missing piece of Microsoft Office 365 for lawyers.” said John Cuddy, Cuddy & Co Solicitors.